The area around Mt. Elbert Lodge is wild and beautiful. Located in the Lake Creek valley,four miles west of Twin Lakes The valley is a high glacial valley which leads up to Colorado’s highest paved pass, Independence Pass. 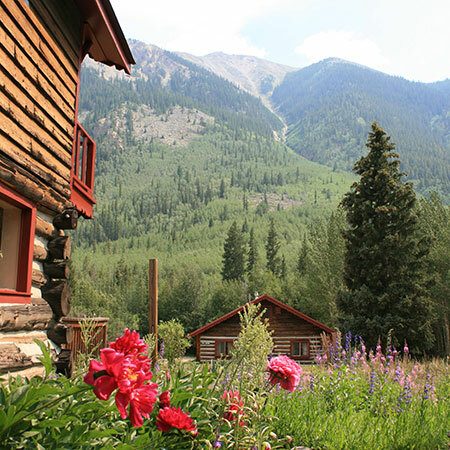 Situated in the San Isabel National Forest, the Lodge is surrounded by several 14,000 foot peaks. You may hike Colorado’s highest peak, Mt. Elbert, right from your cabin door or drive a bit west to bag La Plata Peak. 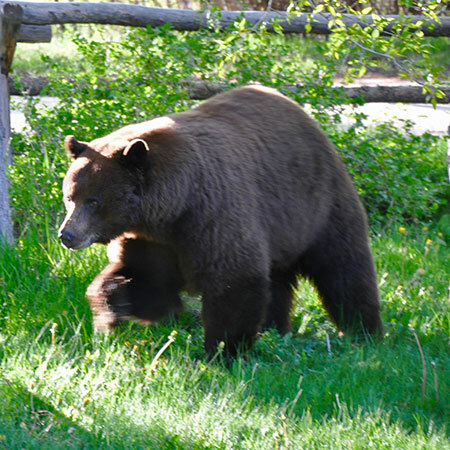 Nestled in the woods, the Lodge area also provides easy access to a variety of exciting recreational and historic sites, including the town of Aspen and the ghost town of Independence (summer only.) 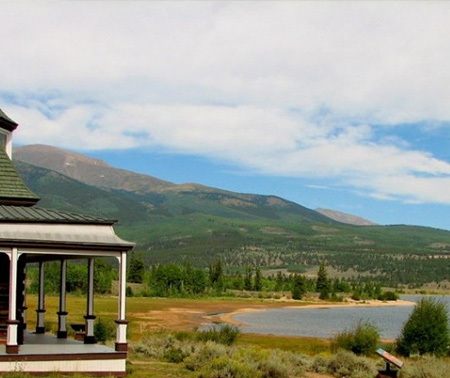 The Twin Lakes Recreation Area, and Leadville Mining Museum round out some of the nearby opportunities to enjoy on your visit. Mt. Elbert Lodge is open year-round allowing guests to experience all four seasons in this part of Colorado’s high country. 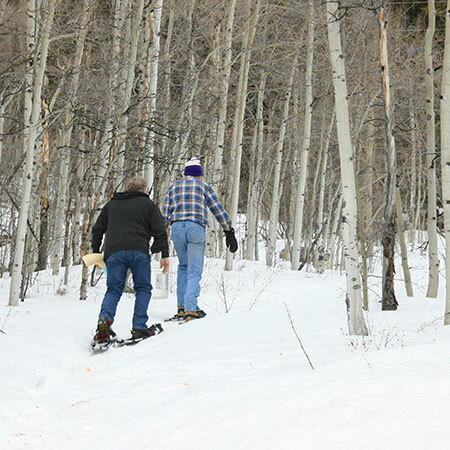 Wintertime guests enjoy cross country skiing and snowshoeing on nearby mountain trails or can travel a short distance for downhill skiing at Ski Cooper. 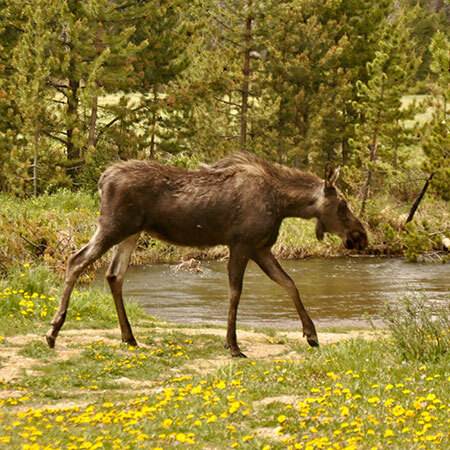 Spring brings forth the awakening of mountain wild flowers, the migration of elk herds, and hiking access to the local trails. 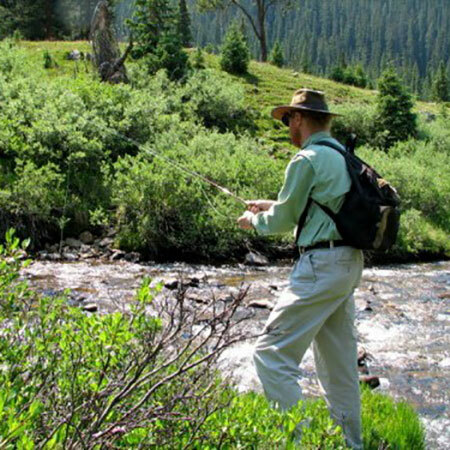 A summer agenda may include fishing, biking, rafting, horseback riding, hiking and climbing. 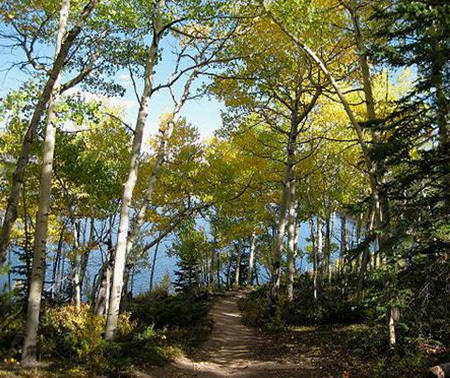 If you stay with us in the fall when the aspen turn from green to gold the fishing and hiking are at their peak as the highest trails become accessible and stream levels drop. Any time of year has its own beauty in the mountains at 9,700 feet. If you visit any of the merchants listed below, please mention that you heard about them through Mount Elbert Lodge. 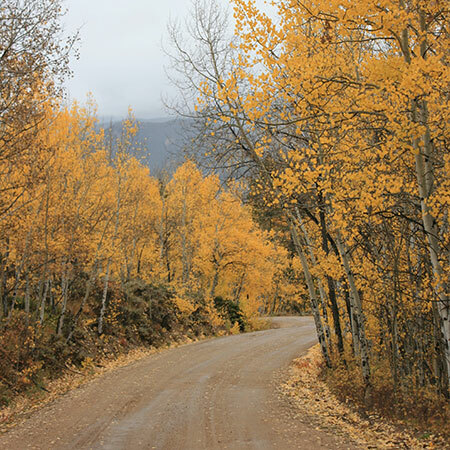 The Twin Lakes – Leadville area is criss-crossed with trails that will take you along mountain streams, into the abandoned mining district or up some of Colorado’s highest peaks, Mt. Elbert, Mt. Massive, La Plata and others. We have included links to some information about some of the trails and will be adding our own descriptions for others as time goes along. Dexter Cabin on the trail to Interlaken has been restored and is often available to tour in the summertime. From Mount Elbert Lodge drive 10 miles east (down the valley) on Hwy 82. If you need some water or other supplies be sure and stop in at The Twin Lakes General Store as you go through Twin Lakes. Take County Road 25, the first dirt road to the right after you cross Lake Creek below the dam. Follow this road back along the lake as far as possible and park in the dirt parking area. The trail starts at the Forest Service message board in the northwest corner of the dirt area. Walk west up the hill, traveling parallel to the lake. 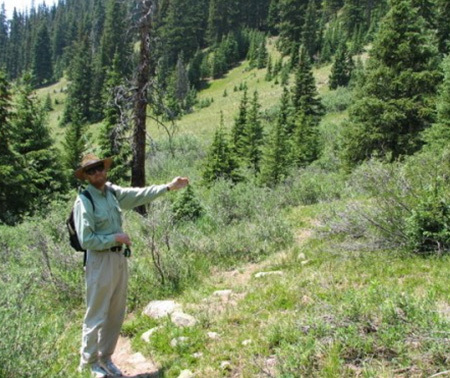 The first section of this trail is also part of the Colorado Trail. About 1 mile in, the Colorado Trail makes a sharp left and starts to climb. For Interlaken, proceed along the lower trail to the old resort. 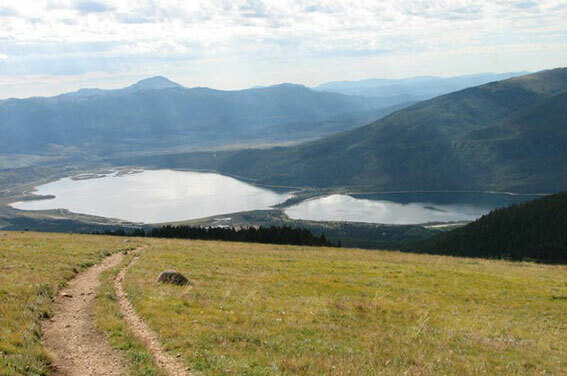 The trail rolls along the edge of Twin Lakes and offers wonderful views of Mt. Elbert. Your destination, the turn of the century resort of Interlaken, is now unoccupied but restoration work continues on the buildings. The cutoff to Blue Lake trail if you passed it and are coming back down the hill. From Mount Elbert Lodge drive 8.1 miles west (up the valley) on Hwy 82. Just before the first tight switchback, pull off the highway to the right on a dirt road (there has been a sign for North Fork of Lake Creek), drive in 50 yards to a gate and park. This trail starts as a jeep road and quickly turns into a trail. It goes up the bottom of the North Fork of Lake Creek valley with timbered slopes on your left and the bare slopes of Mount Champion on your right. The stream is lined with willows and there are a lot of brook trout in the stream. In early and mid summer there are wonderful fields of flowers along the trail. The trail to Blue Lake cuts off to the left just after you cross the stream once you’ve entered the wilderness area. The Blue Lake trail is not well marked and it is fairly steep while going up through the timber. The main trail continues up the north fork and the head of the valley splits into 2 valleys. Take the right hand (east) fork and the trail gets steeper just as you approach Saddle Lake. Just 100 yards beyond Saddle Lake is the Continental Divide (12,420 ft) and you can look into the Fryingpan drainage of the west slope. These lakes tend to thaw out in late June and from ice out to early October can be great cutthroat trout fishing. Time to hike: 1 hour to first stream crossing, 2 hours to tree line, 8- 12 hours round trip to Mount Elbert. Black Cloud is the shortest and steepest of the 3 routes up Mount Elbert. This trail starts 100 yards east of Mount Elbert Lodge. Turn into the small drive way on the north side of the road where there is parking for space for 3 or 4 cars. After about an hour you will cross the stream, then a second stream crossing 200 yards further. For the first 2 hours this is a good trail, a bit steep in places but nothing technical. Once above tree line, the trail becomes quite steep as it climbs a scree slope up to the ridge that leads to South Mount Elbert. 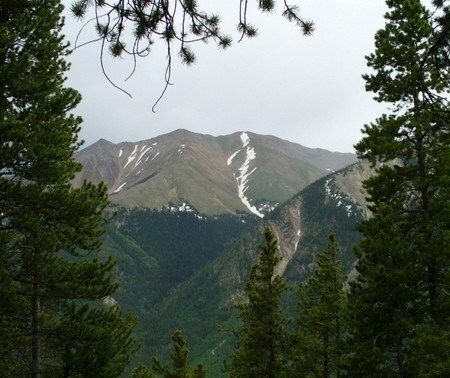 For those who want to climb to the top of Mount Elbert, the round trip usually takes our guests 8-12 hours. 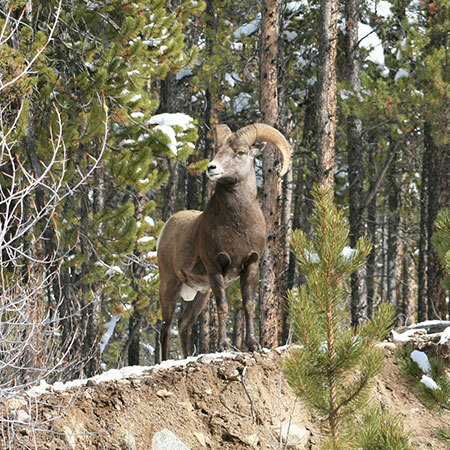 The Mineral Belt trail is a loop around the Leadville Mining District that is great for strolling, biking, x-country skiing or snowshoeing. High Mountain Institute – 719-486-8200 extension 107 ask for Libby. Sawatch Guides – 970-485-3752 ask for Heather. The Trailhead (in Buena Vista) 719-395-8001. These great folks rent snowshoes, cross-country and downhill ski equipment. They are right on your way if you are coming to visit us from the south. While you are enjoing the solitude and quiet of the Twin Lakes area, remember it is just a 45 minute drive to Ski Cooper, Lake County’s small family mountain or an hours drive to Copper Mountain. Just fifteen more minutes drive and you could be in the hustle and bustle of Vail or Beaver Creek Ski areas. Sage Outdoor Adventures Granite CO and Beaver Creek, 970-476-3700, A wonderful group of folks who’s adventures get the highest marks. Buena Vista Colorado, 800-462-7238, A great group of folks, they have whitewater rafting tours for all skill levels including families and have one of the best safety records in the industry. 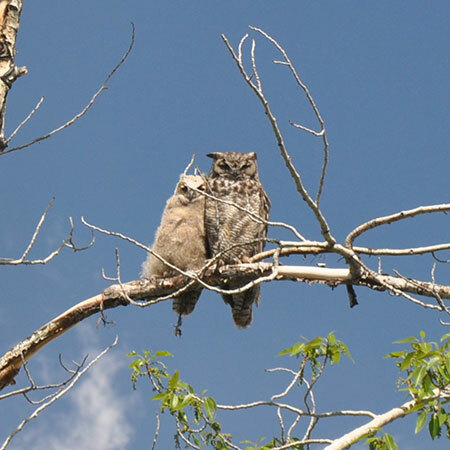 Granite CO and Beaver Creek, 970-476-3700, Snow sports in the winter and water sports in summer, Sage does it all. Twin Lakes Colorado, 866-936-3654, Call for reservations and information. These great folks launch from Red Rooster day use area accessed through Whitestar Campground on the upper lake. Twin Lakes Colorado, 719-251-9961, Just like the name sounds, these folks rent Canoes and Kayaks for use on Twin or Turquoise Lakes. Open typically from Memorial Day to Labor Day. Stop in on your way to your special hole for supplies, fishing licenses and the latest tips on what’s hot and where. Great folks for guided fishing trips and supplies. list of mountain bike trails in our area. (719) 395-8001; bicycle rentals and outdoor specialties. 1-888-4-LOOP-RR (1-888-456-6777) Ride behind a steam powered locomotive through the Colorado Rocky Mountains, over the loop’s high trestle. This train is about one and a half hour drive from the lodge. Open daily May through October 9-5, Monday through Friday November through April 10-2, winter weekends by appointment. 120 W. 9th Street, P O Box 981, Leadville, CO 80461 – 719-486-1229. Fee. 414 W. 7th Street, Leadville, CO 80461 719- 486-3900 or 719-486-1899. Guided above ground tour of the mine associated with Horace and Baby Doe Tabor. Please mention Mount Elbert Lodge when you call for reservations at any of these restaurants. Twin Lakes 719-486-7965 – Formerly The Nordic Inn and then Inn of the Black Wolf. Just 4 miles away in Twin Lakes, with great dinners. Please call for reservations.